2007. Long-time Hypnos listeners may recall that we released a couple of compilations in the early years, The Other World and Weightless, Effortless, which included exclusive tracks by many of the all-time greats of this music scene. Both those compilations were very well-received by critics, DJs, and all kinds of listeners. So you could ask, and many have, why hasn't Hypnos released any more compilations recently? Maybe because they're a lot of work, much more work than a regular CD by a single artist, and time is always a constraining factor when running a small label by yourself. Do you do one compilation album, or do you spend that time putting together two or three regular CDs? Well now, Hypnos is no longer a one-man operation, so more time is available, and that has allowed us to take on the task of putting together these compilations. 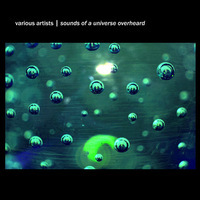 The first compilation is Sounds of a Universe Overheard, a collection of ten tracks exclusive to this CD, created by a cross-section of ambient, experimental and soundscape artists from around the world. Included in this diverse group are more established recording artists who will be known to most listeners to these genres, as well as new, emerging names. We feel a compilation is most interesting when it varies from the familiar to the new. This disc covers all sorts of territory in terms of sound, from more musical and soundtrack-like sounds, to darker ambient, to pure sonic experimentation. Jonathan Block, better known as Synthetic Block, has released electronic music on such labels as Hypnos/BInary and Gears of Sand. M. Peck, based in Tennessee, has recently released two collaborative CDs with Mark Mahoney, but his Glacial on Gears of Sand is a great solo debut. Freq. Magnet is an alter-ego of one half of ambient/experimental duo Austere, working entirely with treated electric guitar, who has two solo full-length CDs, Étoiles du Couvrecle and Principium Somniferum. Kirk Watson appeared previously on a compilation, Passing Strange, on the short-lived Broad Vista label. dreamSTATE, a duo from Toronto, Canada, have released several CDs and have been active in collaboration with other artists, and on compilations on such labels as Umbra, The Foundry, Dark Duck, and Atmoworks. Seren Ffordd is a sound artists working in Wales, who has released several CDs on the Umbra & Penumbra labels, as well as a recent release on Hypnos Secret Sounds. Dwight Ashley is a long-established ambient composer with several solo CDs as well as well-received collaborations with Tim Story. Justin Vanderberg is a relatively new name, but his debut CD In Waking Moments on the Hypnos Secret Sounds label has been well-received, and marks him as a name to watch. Igneous Flame is a British ambient/soundscape artist who has come on very strong in just the last few years, with his self-released albums gaining positive notices. Tau Ceti is an Italian ambient minimalist, and frequent collaborator with his countryman Oophoi, on whose labels Umbra & Penumbra the majority of Tau Ceti's delicate works appear.